ROJAK 15: 12th June Saturday, 8pm till late @ Emily Hill. i’ll be giving a presentation about my work (amongst 9 other local artists) at ROJAK 15!!! 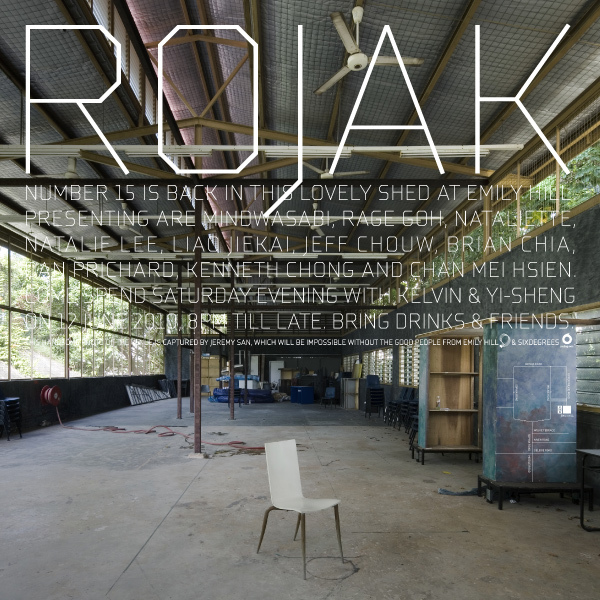 ROJAK is a crossroad where creatives from different disciplines come together to present their works and processes. Each session, featuring 10 presenters, is always intimately curated. Come listen, have a drink and join in the fun! it’s happening on 12th June Saturday, 8pm till late at a lovely shed on Emily Hill. i’ll be #3. my crazy friend Jeff is also presenting his photography. so do drop by and bring friends, drinks and beer!